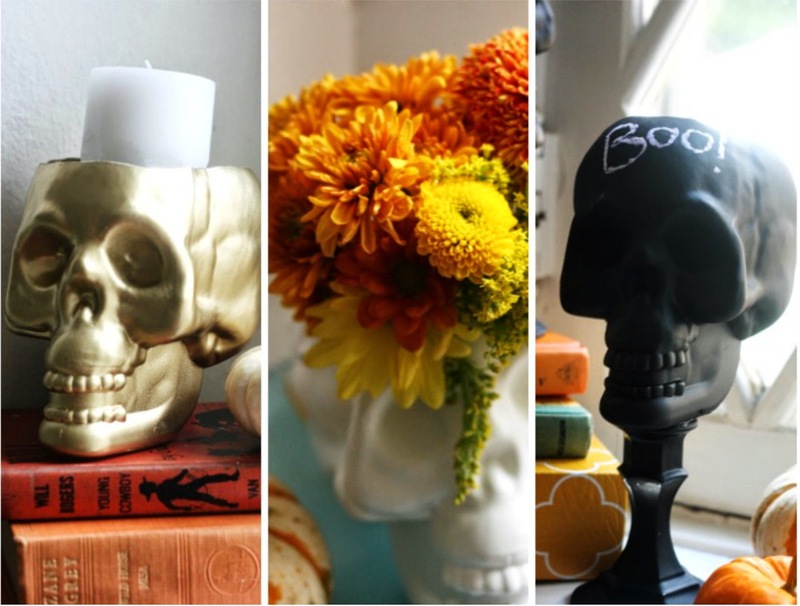 Last week I found my kids Halloween costumes and that sort of thing can really get a girl’s festive juices flowing so I have taken to Halloween decorating full force at my house. 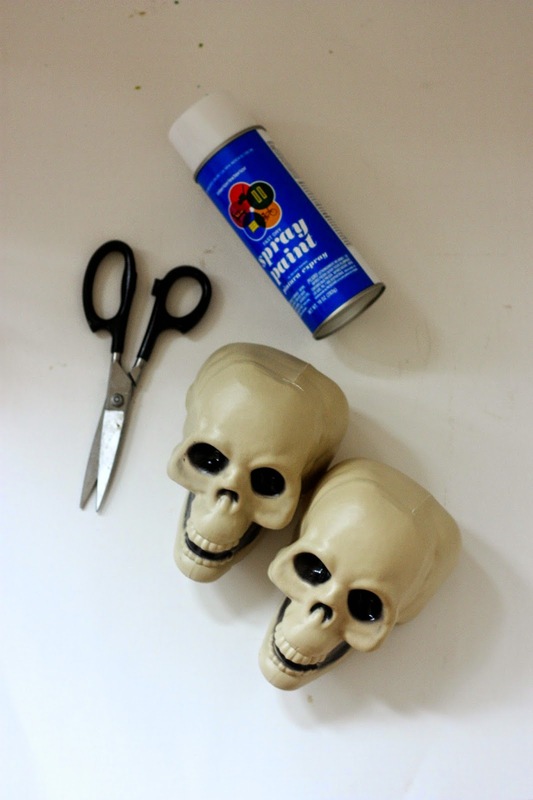 One of my favorite crafts came after visiting my local dollar store where I found these plastic skulls and it was clear, the DIY possibilities with these suckers were endless! 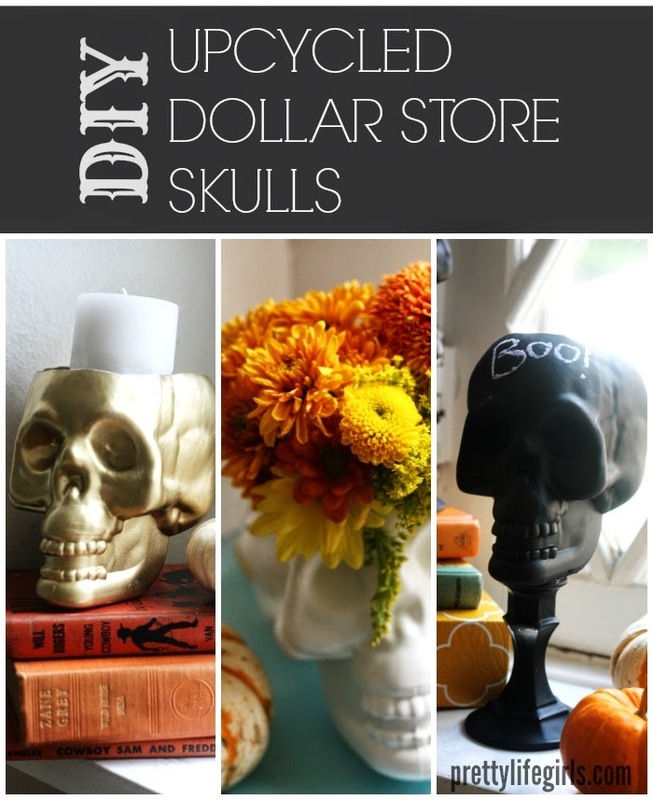 So I picked up a bunch, and here’s how I made these DIY Upcycled Dollar Store Skulls! 1. 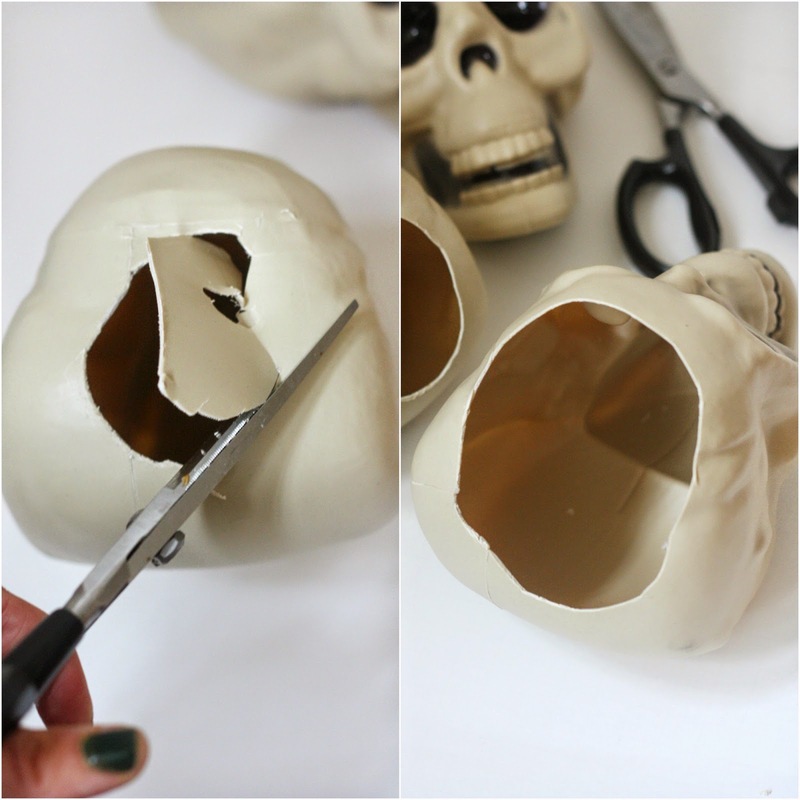 First, cut a hole in the skulls you plan to use as vases or holders. You’ll want to cut them before you spray paint them or else you will ruin your paint job trying to hack through that plastic. 2. Next, paint! 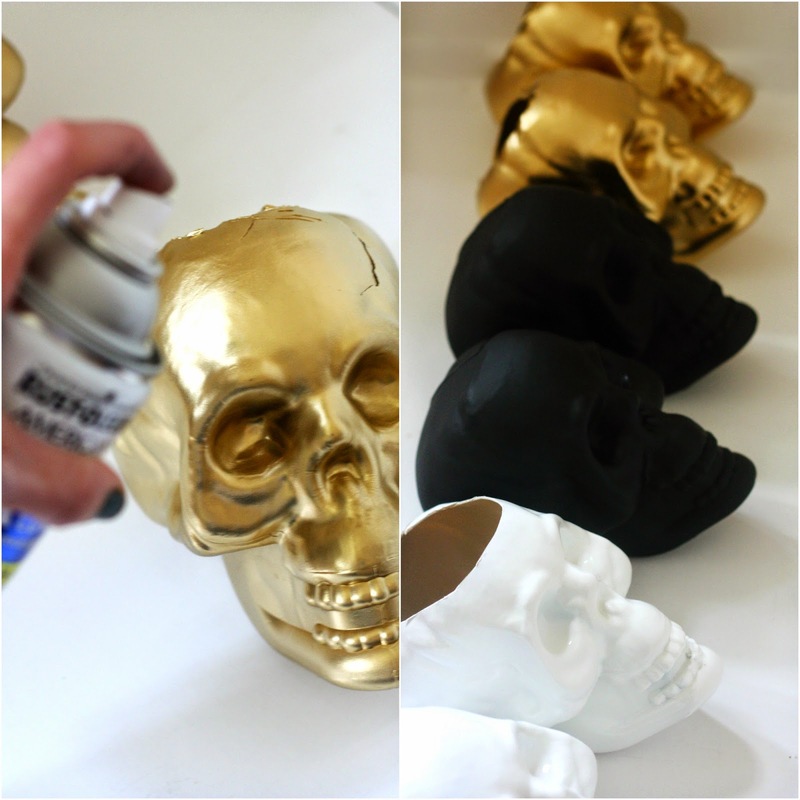 I used three kinds of spray paint for my skulls, a glossy white, a gold metallic, and a chalkboard black. I found all of my spray paints at Walmart. 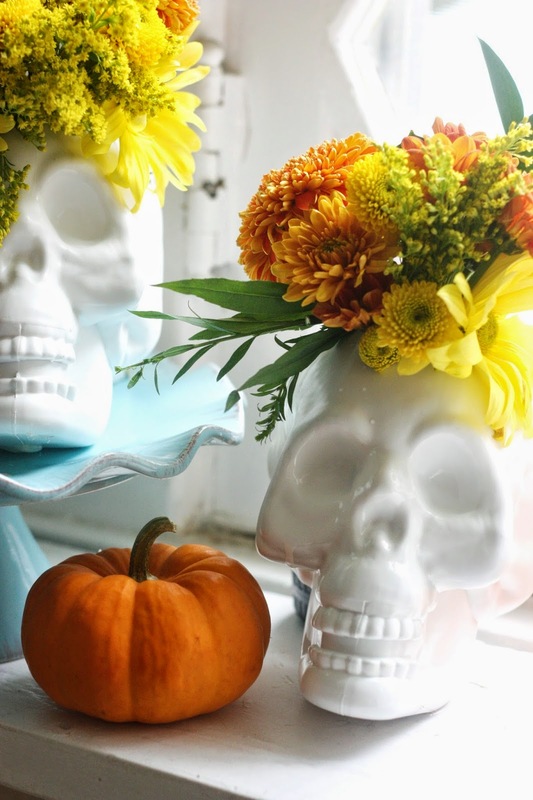 Skull Vases: First, I filled a couple with fresh flowers! All I had to do for this was fill in a small hole at the bottom of the skull with a little hot glue so that they could hold water. Then I was able to easily fill them with water and put in the flowers. 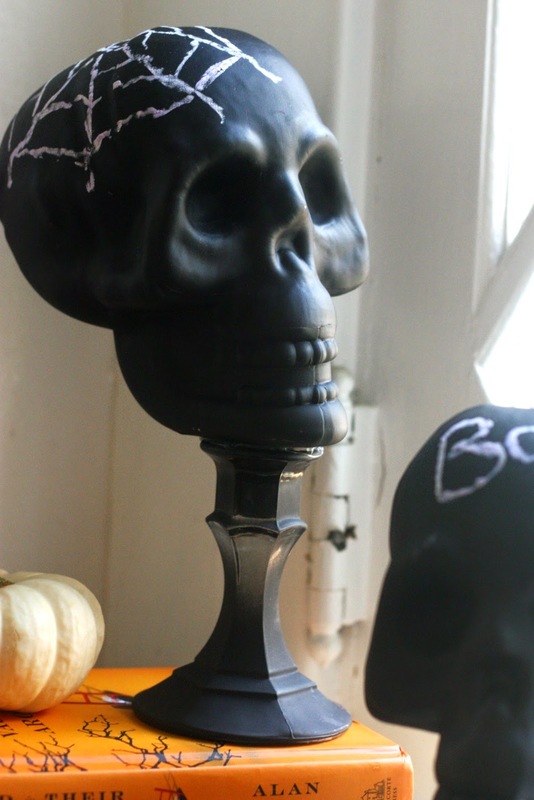 Chalkboard Skulls: With these skulls I chose not to cut holes in the top and just display them as is. 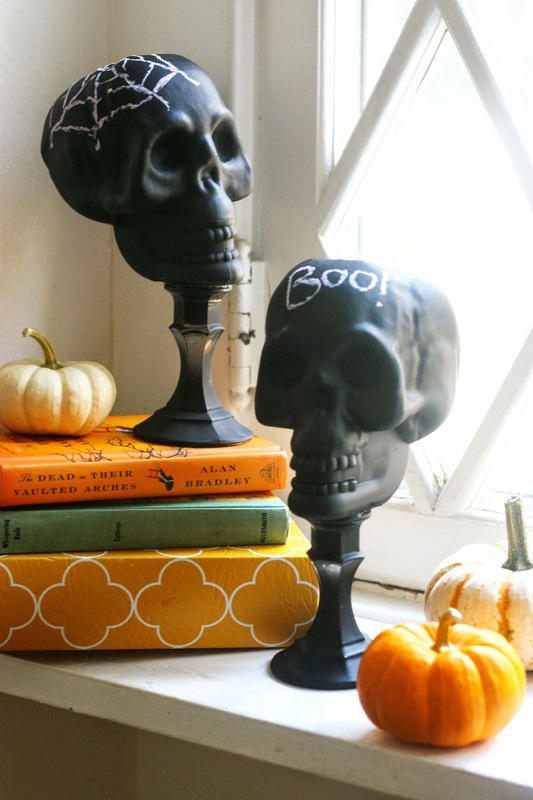 I also picked up two glass candle sticks from the dollar store, spray painted them the same color, and glue gunned them together! 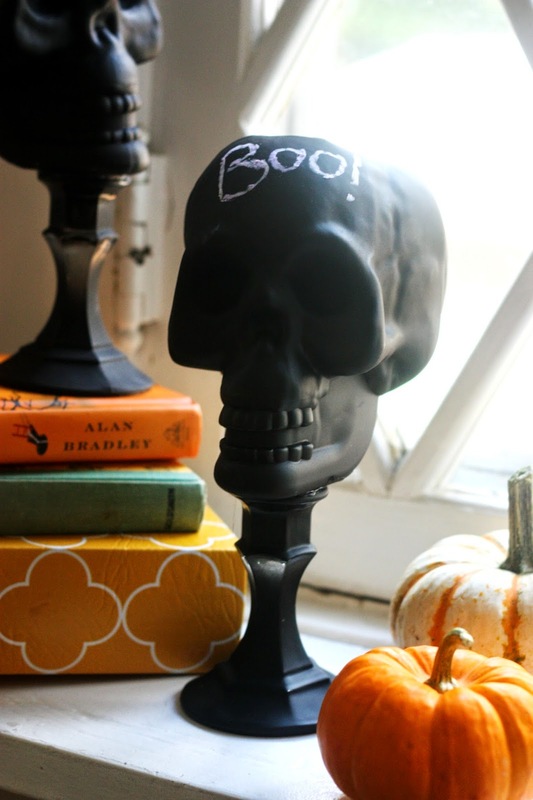 So fun to draw on and spoooooky! 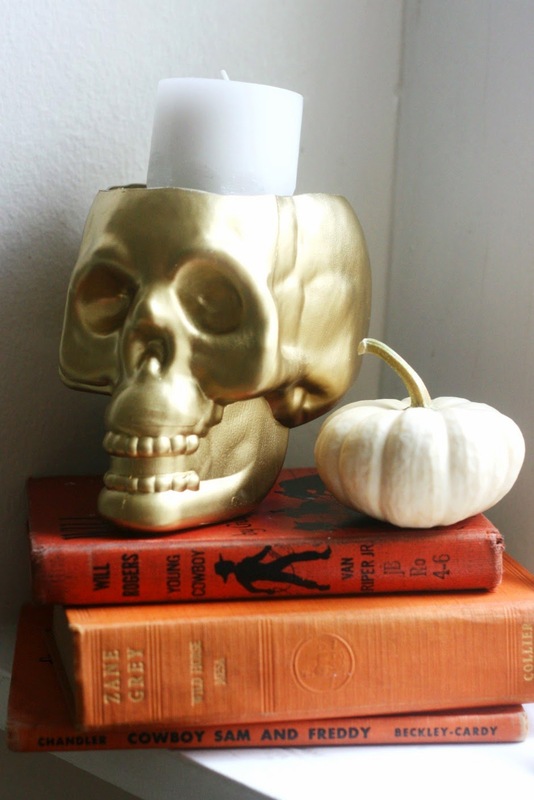 Gold Candle Holder: Lastly, I cut a hold big enough for a large candle that I also picked up from the dollar store! This one ould not have been easier. 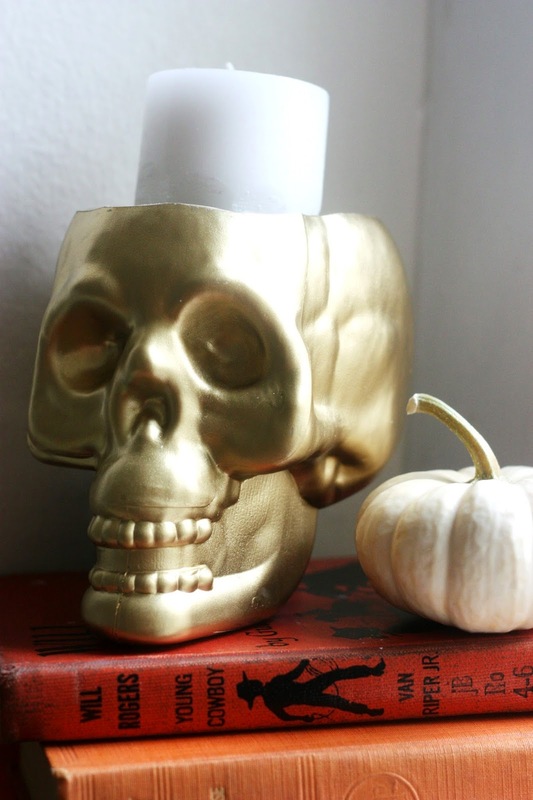 Cut hole, put in candle. BAM. Halloween glam. That’s it! 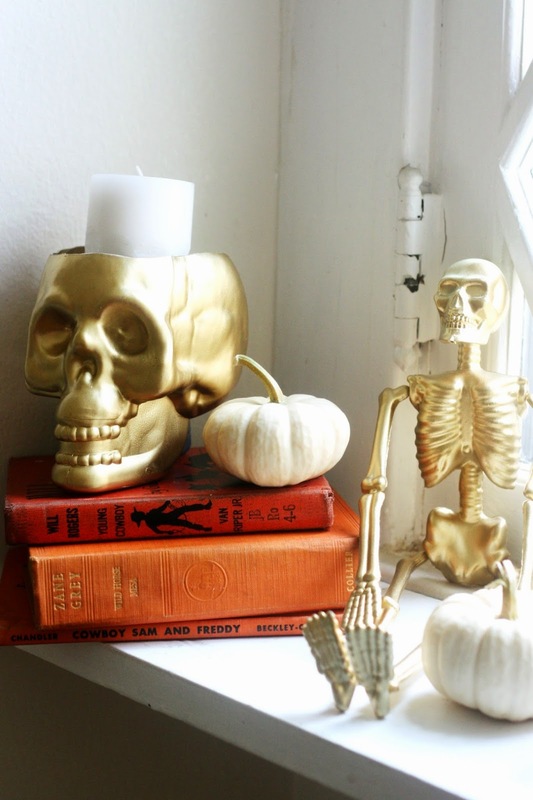 For just a couple of dollars you have now made your house spooky and fabulous! « Out & About at the Pumpkin Patch! 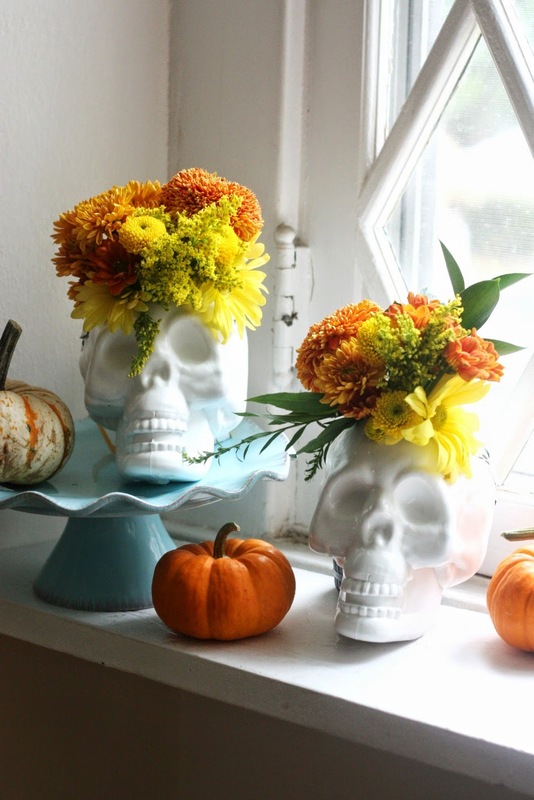 Such fun ideas! 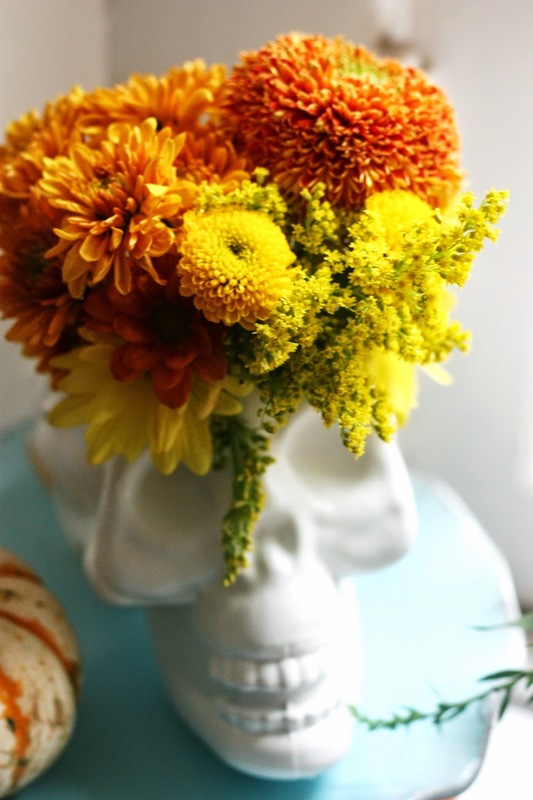 Love the planter skulls especially!